Lenovo has come up with something interesting at CES 2016. They have launched a mini desktop with an optional wireless projector. The spectators at the CES were surprised to see something different from the normal desktop PCs. When I saw the device I was reminded of the gadgets used in the latest Star Wars movie. This model is named as Ideacentre 610S. This device is advanced and you can perform certain tasks without the help of display screens, but with the help of projector. Let us have a look onto the specifications of the latest launch from Lenovo. The packed projector is wireless which means it need not be connected in wire with the processor to function. This projector can project images with a screen size of 100 inches and can be optimized at a distance of 2.4 meters. The resolution of the image comes to be 720 pixels. It is featured with Texas Instruments DLP chip. 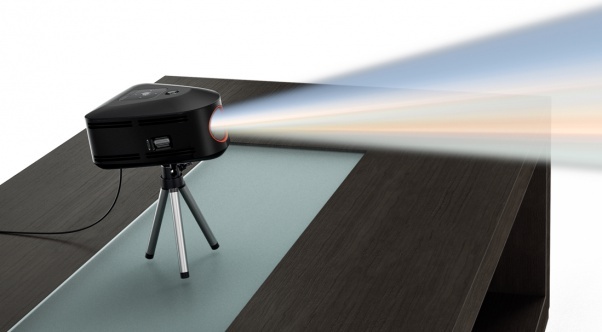 This projector can be easily laid on the top of desktop unit or can be placed in a tiny tripod. Fortunately you are provided with one such in-built tripod hole in the desktop unit. This wireless optional projector is loaded with 3W speaker, one USB port and one HDMI port. The projector can be used as independent unit as well. The processing unit of the Ideacentre 610S is packed in a case of just 2.2 liters. This unit is powered by Intel Core i7 Skylake processor. The user can have a RAM upto 16GB with the help of DDR4. This processor is also loaded with graphics support from NVIDIA GTX 750Ti which supports 2GB of GDDR5 GPU. This one ensures that graphics oriented programs are executed without any processing lag. The processor supported by extensive graphics ensures that you can play high-end video games and watch 4K videos without any problem. Ideacentre 610S supports WiFi connectivity with a bandwidth of 802.11 ac. It also supports Bluetooth of v4.0. This unit is loaded with 4 USB ports of v3.0, one HDMI port and 3-in-1 card reader. Users are also allowed to connect the processing unit of Ideacentre 610S with a monitor and use it like a normal desktop PC. The entire unit including the projector is tagged with a price of US$849. The company declared that the sale of Ideacentre 610S will start officially from June 2016.